Balquhidder (Balwhidder), village is at the foot of Loch Voil in central Scotland, where west Perthshire meets the Trossachs at the gateway to the Highlands. Balquhidder glen evokes emotions that are heightened in the knowledge that druids, Jacobite rebels, ancient clans, ancient Royals, famous authors and Rob Roy McGregor have tread before us. Punctuated by Munro's, trout filled lochs and wildlife this hauntingly beautiful glen is drenched in history and folklore centred around a Kirk yard that tells a thousand tales. 5 miles south of Lochearnhead, 23 miles north of Stirling and 4 miles north of Strathyre , the exit off the A84 first leads to the Kingshouse Hotel, originating from 1590 and once used by Stewart Kings as a Royal Hunting Lodge. Veering right, two miles past Auchtubh, you will arrive in the village of Balquhidder where the Church becomes obvious to the right. The stones in the Kirk yard and the “Friends of Balquhidder” information room paint a detailed picture of characters that have left an indelible mark here. 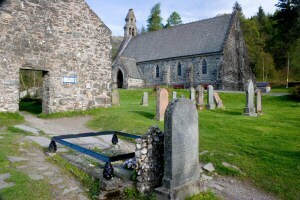 The oldest gravestone belongs to an Alex Fergusson of Ardandamh who died in 1663 though people have worshipped here for millenniums with evidence of an 1880BC Neolithic temple on nearby Ben Ledi and worshipping stones on Tom nan Aingeal (Hill of Fire) which rises behind Balquhidder church. Druids lit heath fires here on pagan festivals like Beltane, May Ist. 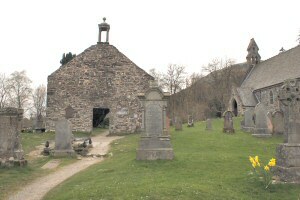 St Angus was the first apostle of the gospel of Christ in Balquhidder in V111. A stone carved in the image of a priest holding a chalice, said to have marked Saint Angus 's grave, was taken into the present church for safekeeping in 1917 during the Great War, where it can still be enjoyed today. Eaglais Beag (Little Church) was a pre-reformation chapel that was once visited by King James IV . It was built in 1250 by Abbot Labhran on the original site of St Angus 's grave stone. One of the ancient clan names in the region “McLaren” or McLaurin derived from this 13th century abbot whose surname is Celtic for Laurence. You will see the remains of a church that was build on the site of Eaglais Beag in 1631 by Lord Scone. David Carnegie , laird of nearby Stronvar estate, built the present church in 1855 and interestingly an identical copy in Sweden for the benefit of workers in his sugar refinery. His family burial vaults lie in the ruins of the old church. Robert Roy McGregor's gravestone attracts many people to the region. He was born Raibert Ruadh MacGhriogair in 1671. “ Ruadh” means red and related to the colour of his hair, though it was expressed as “Roy” when his name was anglicised from Gaelic . He is buried along with his wife and two of his sons. Rob was a cattle dealer who was later branded an outlaw, yet worshipped a hero after his life story was fictionalized by Daniel Defoe in the book “Highland Rogue”, written during his lifetime. Sir Walter Scott penned “McGregor's Gathering” in 1817 helping to keep the memory of Rob alive. 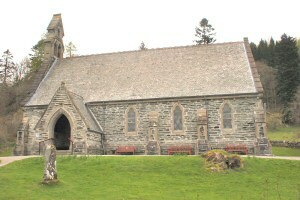 A number of TV and film productions made between 1911 and 1995, together with stories in Balquhidder church, suggest that he will ne'er be forgotten. 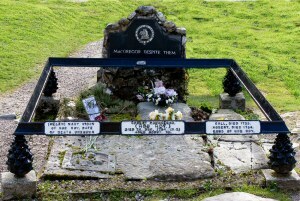 The slogan “McGregor despite them” was added to his gravestone in the 1980's taken from a line in “McGregor's Gathering”. Rob's life story gives an interesting account of the early 18th century and the Jacobite rebellion, yet his clan was not always the dominant force in the area. Indeed the land was McLaren country until McGregor's claimed territory, having been ousted from their ancestral lands by Campbells. This lead to generations of family feuding. A stone in the churchyard tells of 18 McLaren families resident in Balquhidder who were murdered by McGregors in 1558. Their reputation as clan slayers led to the name McGregor being outlawed by James VI in April 1603. In an act of Scottish parliament, he organised for the name McGregor to be abolished and the “… whole persons of that name should renounce their name and take some other name and that they nor none of their name and that they nor none of their posterity should call themselves Gregor or MacGregor under pain of death ...”. Persecution of the clan who became known as “Children of the Mist” ended in 1774 when McGregors were finally allowed to re-establish themselves. McLarens and McGregors continue to fight for precedence in this region. While they still fight a physical battle it is in the more socially acceptable and friendly form of a tug–of-war, held in Lochearnhead at the annual Highland Games. The day after, chief Donald McLaren of McLaren, whose home is in Balquhidder, rallies his clan on the cliff top behind Balquhidder church known as ‘Creag an Tuirc' or (Rock of the Boar). It takes around twenty minutes to walk to the summit though anyone can witness the gathering. A cairn marks the spot where past members would have congregated in times of trouble. It offers one of the finest views of Balquhidder glen, looking down on the church yard and right to Loch Voil and the Braes (meaning hillsides or slopes) of Balquhidder. When you visit the Kirk; be sure to visit the “friends” room where you will find interesting mementoes and read about characters like the Reverend Robert Kirk , who has become most famous for his documentation and belief in fairies. Decide for yourself whether he was gifted with second sight or mad as a brush. Find out about traditional clan names and septs of McGregor, Stewart, Fergusson, McNab, Macintyre, Buchanan and Campbell. Read about William and Dorothy Wordsworth 's visit to the area leading to “The Solitary Reaper” and “Rob Roy's Grave” being written. Experience the very place that inspired Robert Tannahill to create the poem “The Braes of Balquhidder” and school teacher Elizabeth Beauchamp to write a one hundred and eighty page historical account using the same title. Today the church and the village hall are the heart and soul of the community with pantomimes, art exhibitions, flower festivals, summer music concerts and other events brought to life all year round by locals and welcome visitors. The nearby Library Tea Room with its quirky furniture and china serves hot drinks and delicious home baked cakes during the summer season supplied by the Monachyle Mhor hotel which is 4 miles along the road past Loch Voil and Loch Doine. This road comes to an end near Inverlochlarig farm owned by speciality butchers the McNaughtons who have farmed there since 1877. This is also the site where Rob Roys house once stood and where he died in 1734. Balquhidder is an excellent location for cycling and is on national cycle route 7 which leads through the village and on to Strathyre. The Fishing, golf, walking, wildlife and history enthusiast will also be at home here with a superb choice of accommodation in the area. “The Villagers” is an award wining monthly newspaper for anyone who wishes to keep up to date with news and events in Balquhidder as well as Lochearnhead, Strathyre and St Fillans. Copies are available from local shops and post offices. 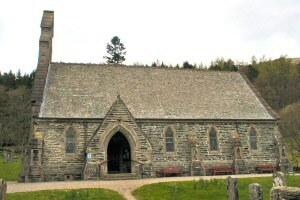 The Belfry is a twice yearly newspaper published by “The Friends of Balquhidder”, who are member volunteers that look after funding in order to maintain the church. 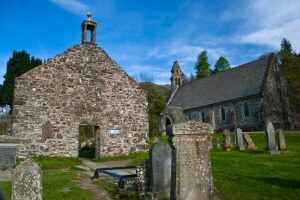 Details on membership and how to obtain copies can be obtained in Balquhidder church. There are many reasons to visit the glen which is why McGregors and McLarens from all over the world are not the only ones who return here.